COVERT SURVEILLANCE AND drones are to be used to crackdown on illegal dumping. 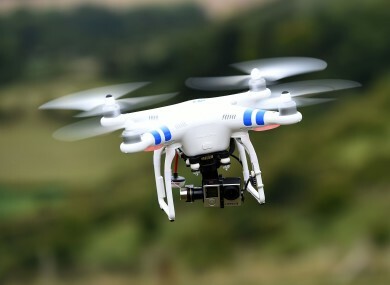 Minister for the Environment Denis Naughten has secured funding that will be used to target fly-tippers nationwide using covert surveillance and smart technology including aerial imagery from drones and satellites. The installation of CCTV cameras and better enforcement and prosecution will also form part of the new crackdown. Dublin City Council figures for 2015 show there were 858 cases of illegal dumping reported. However, the council said it should be noted that not all are reported. Minister Naughten is due to launch the new drone initiative in Ballinasloe on Monday. While €2 million has already been set aside for the recruitment of extra enforcement officers at the Environmental Protection Agency, the drone project will be funded separately under the Environment Fund. A minimum of €650,000 will be initially allocated to community groups and state agencies who will work in partnership to deter illegal dumping. “Through the use of smart technology I am confident the new initiative that I am introducing will prove effective in both deterring and catching illegal dumpers. “We have to be one step ahead and technology and community engagement will give us an edge in combating this scourge. My message is clear, if you dump waste illegally and blight our countryside and roads with filth you will be caught and prosecuted,” said Naughten. Aerial imagery from unmanned aerial vehicles, CCTV, satellite imaging and smart phone technology are all tools the government plan to use to reduce dumping. Ireland is not the first country to use drones to tackle crime. The Australian province of Victoria recently began a similar initiative. Areas where illegal dumping has been highlighted as an issue will be targeted under the new scheme, focusing particularly on 51 disadvantaged areas across the country, both urban and rural areas. Funding will be allocated to support projects where community groups and other state agencies work in partnership to clean-up and prevent illegal dumping. “I am encouraging community groups across the country to come together to apply and benefit from extra funding for this crackdown,” Minister Denis Naughten told TheJournal.ie. With illegal dumping on the rise, other politicians have called for more innovative measures to tackle the issue. Fine Gael Senator Paul Coghlan recently called for those caught dumping their rubbish to be named and shamed online. Naughten said harnessing new technology will increase the numbers of those being caught in the act, and should bring down the numbers. Email “Drones to be used in crackdown on illegal dumping”. Feedback on “Drones to be used in crackdown on illegal dumping”.